My first review! My reviews will go like this: I’ll tell the story of the meal if there’s any, what we ordered, and how much, interspersed with pictures. I’ll end with a summary and rating on a 10-point scale. 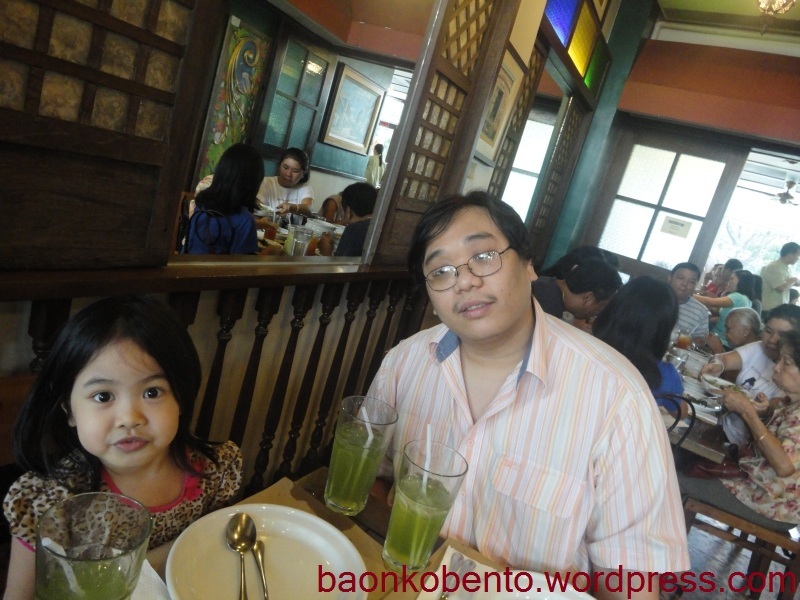 During my week-long vacation, my husband, daughter, and I decided to go out for lunch and eat at Kanin Club at UP Technopark. 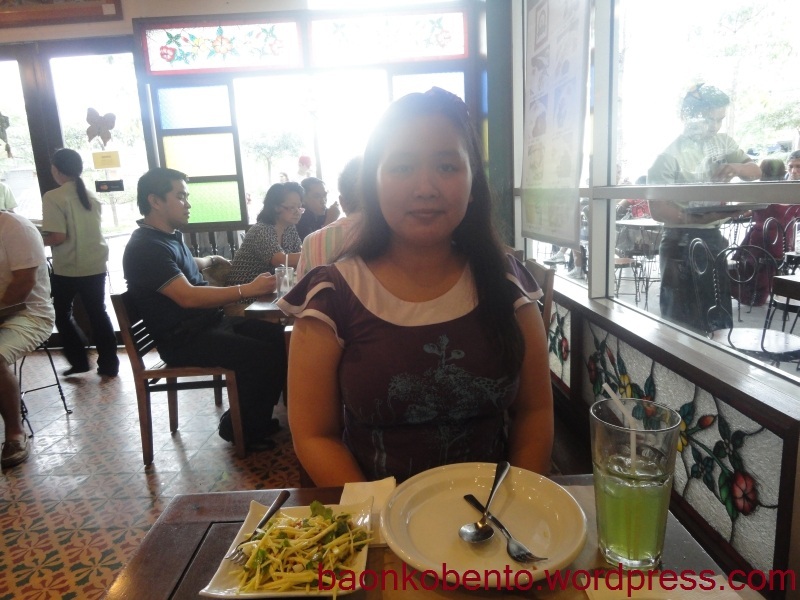 We’ve tried Kanin Club before, with my parents and brothers, during a birthday celebration last 2010. 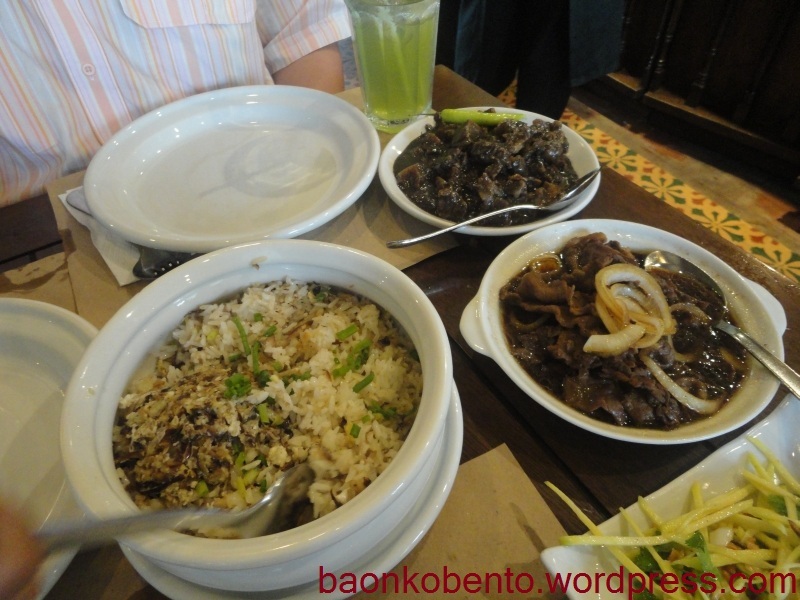 We were very impressed with the food, especially the crispy dinuguan. My husband was craving for it, so we thought we’d try it on our own. We were already a little late for lunch (it was past twelve), and we were expecting shorter lines than what we are used to seeing. Way off the mark. The line was 10 groups deep, and each group was about 8-10 persons. The good thing there was, even at 10 names below the first, we were going to be the first small group. After around 10-15 minutes of waiting, we were finally seated in a small table near the bar. 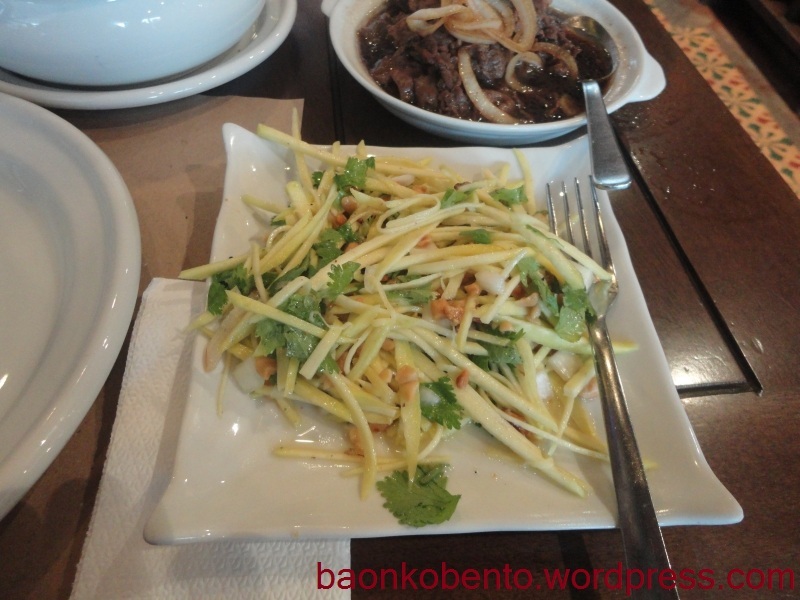 The first of our order to arrive was the side dish: green mango salad. It was wonderfully sour and spicy, and the mango slices were crisp. My husband thought it was too sour, but then he’s not really fond of sour. I, however, adore a good sour green mango. Since my daughter is not fond of dark colored or “dirty”-looking food, we decided to order a second viand alongside the aforementioned crispy dinuguan. 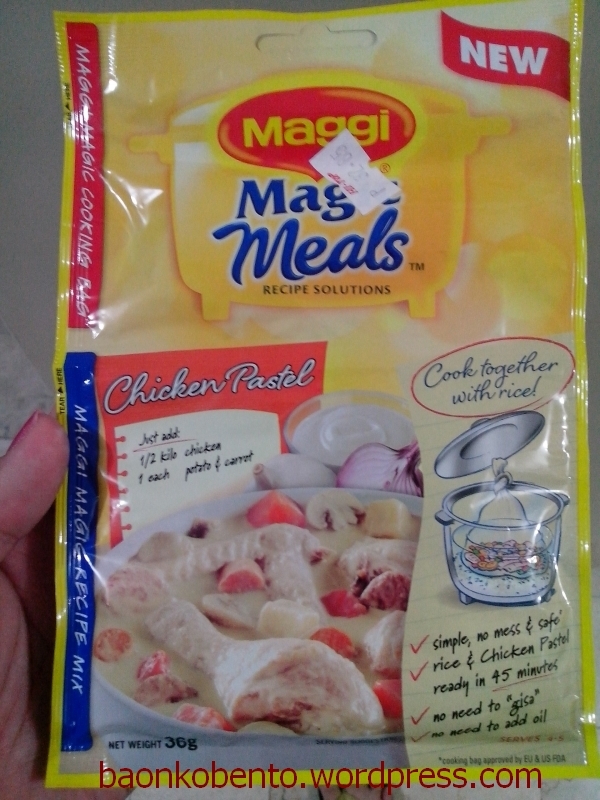 We decided on bistek tagalog, a relatively safe bet since she does eat beef at home. It was better than expected! The seasoning of the beef steak was awesome, although the meat wasn’t all lean. The crispy dinuguan, on the other hand, is what we remembered it to be: crispy and satisfying. We ordered a bowl of tinapa rice to go with the viands. My daughter didn’t like the fish (too salty), but she took the rice just fine. The tinapa goes very well with the slightly fried rice, but the amount was a bit short, and we had to order an extra cup of plain rice. 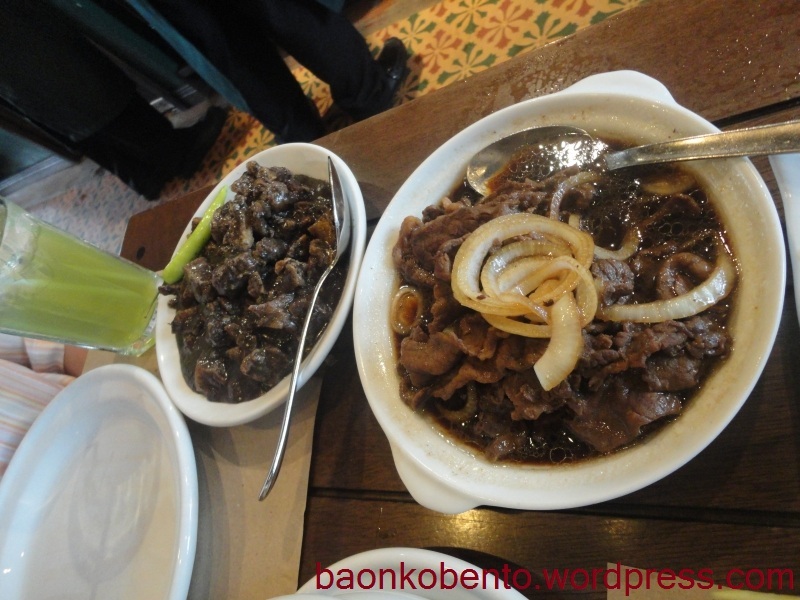 We had no complaints about the food, except perhaps that we should only have ordered one viand and a side dish. We had to take home half of both the dinuguan and the bistek. But then, Kanin Club is supposed to really cater to big family groups. The service, unsurprisingly, was a little lacking, since the restaurant was packed to the rafters, which is why we only ordered single-serve green iced teas for beverage. Even though we were right near the bar, I doubt we would have gotten refills if we ordered bottomless. The place itself was traditional filipino house themed, with wooden shutters and wooden furniture. However, there is very little elbow room and you always have the feeling that you’ll collide with heavily-laden waiters. Summary – Great food, so-so service and ambiance. 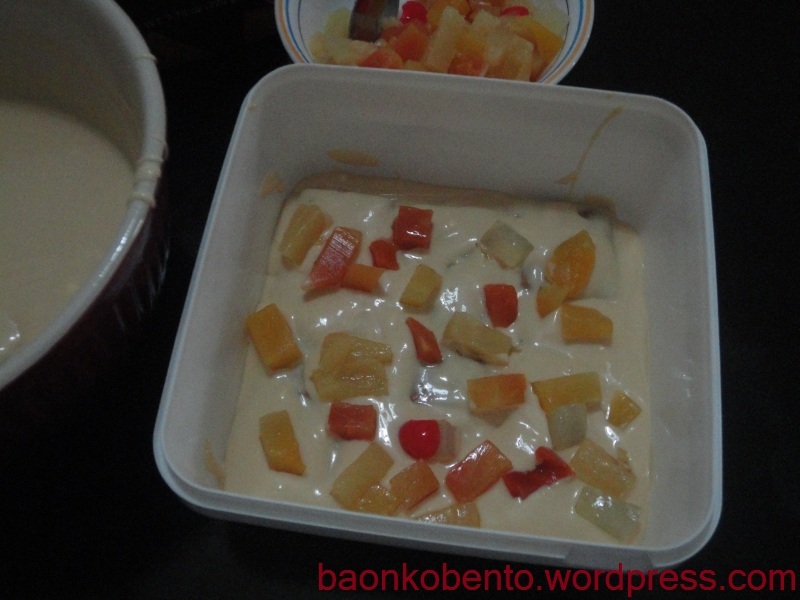 ~Php 1000 for the three of us, with take home leftovers. Worth going to if you’re willing to brave the lines. 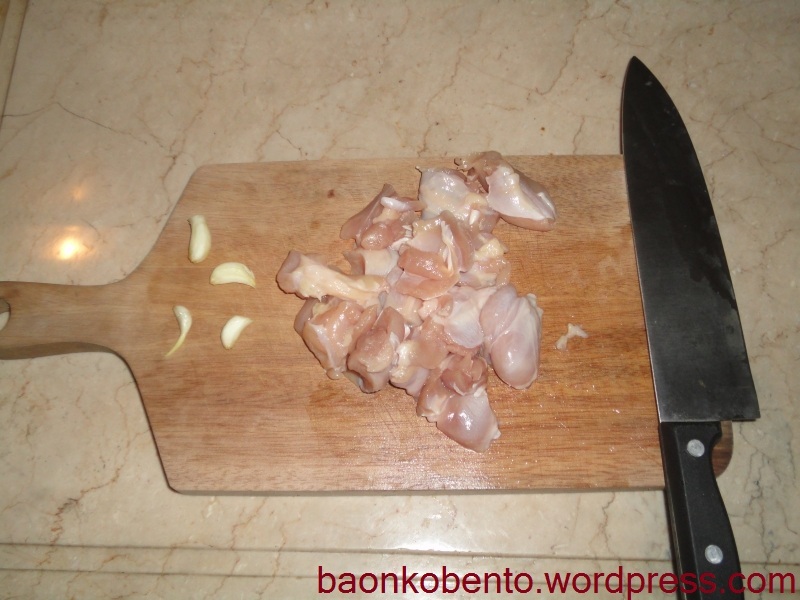 It’s not very hard to make adobo, once one understands the underlying concept of it. 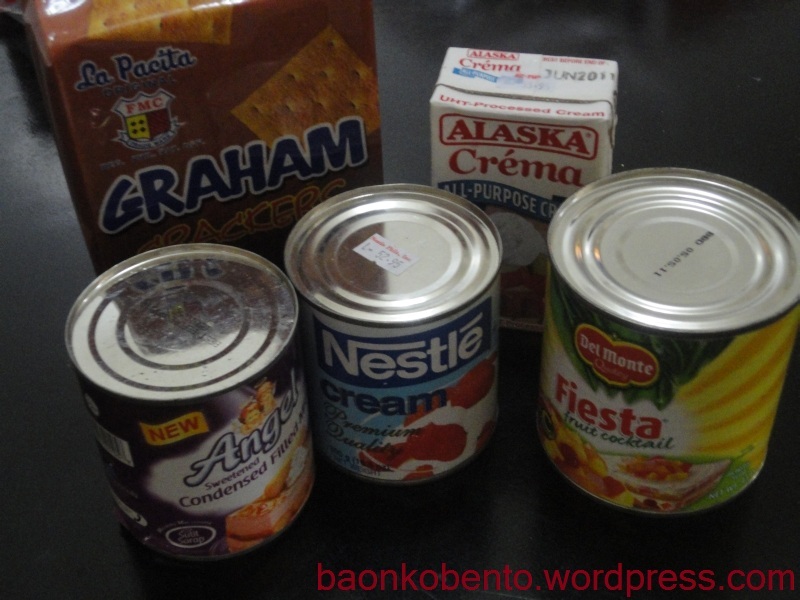 I’ve been dithering for some time whether to attempt making adobo by myself. I’ve been consulting recipes off both the internet and my MIL’s cookbooks, trying to find something simple which I could attempt. But then I realized, it’s basically a very simplified version of the soy chicken I did before. 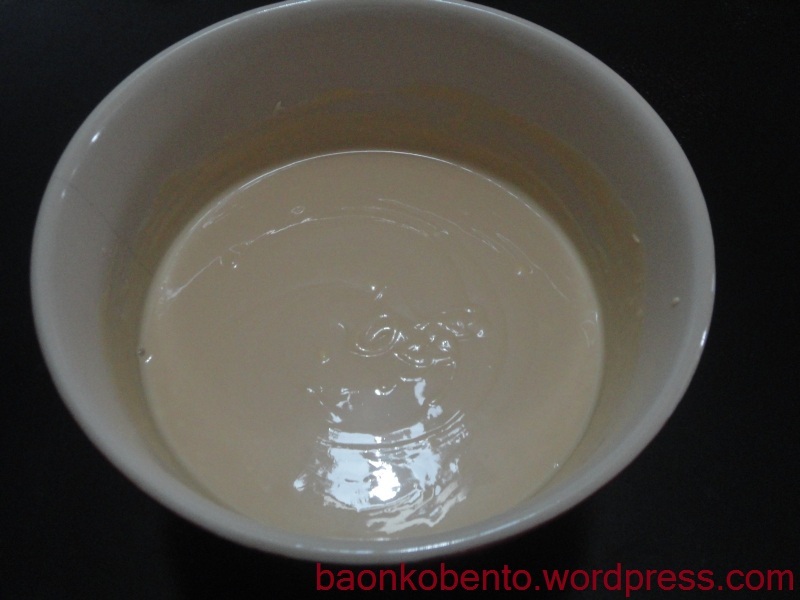 It is a base mixture of soy sauce and vinegar in which the meat is allowed to simmer until it becomes tender and absorbed the flavors of the broth. Before I share the recipe, a disclaimer: Please note that there are actually several variations to adobo, and each one is just as valid and delicious as the next. 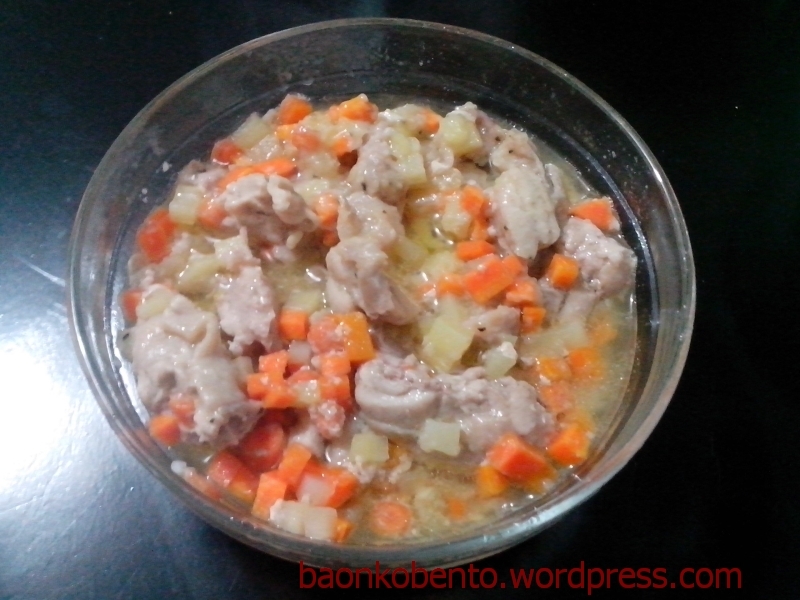 This version is the one I grew up with, a soupy and very sour adobo. 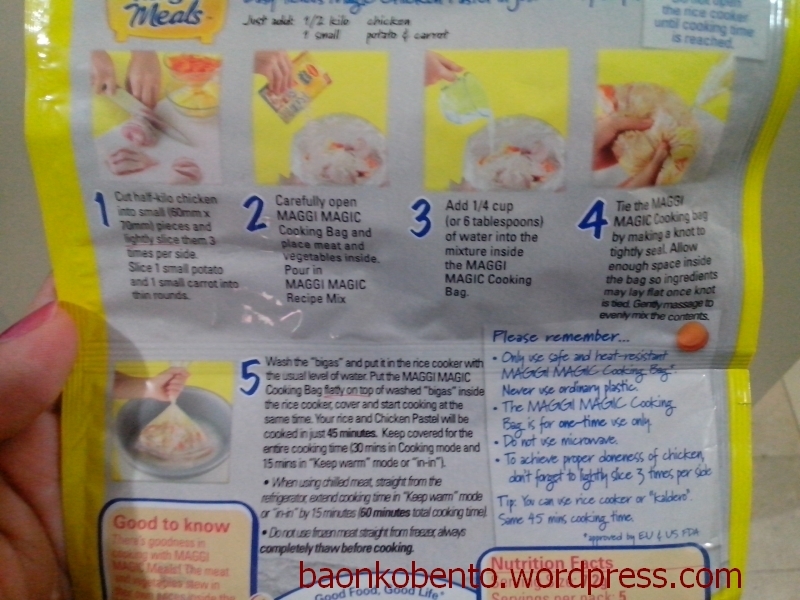 And since I am specifically cooking for my own baon, I came up with a recipe for just a single serving. Smash the garlic cloves with the flat of a knife so you can take them out of their shells. Don’t chop them; just leave them still vaguely clove-shaped but broken in several places. Set aside in a small saucepan. Roughly chop the fillets into half an inch to an inch cubes. Put them in the saucepan with the garlic. 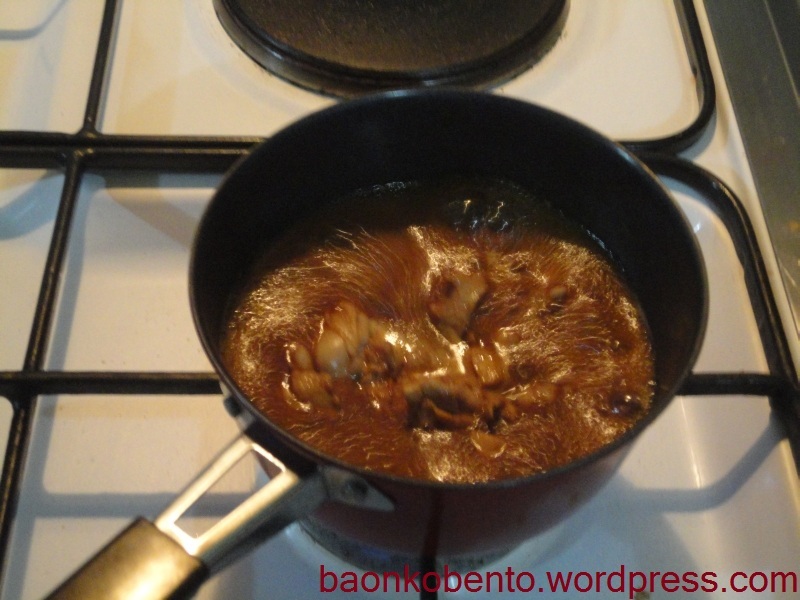 Add 1 tbs soy sauce, 2 tbs vinegar, some salt and pepper, and around 2 tbs water into the saucepan. Bring to a boil, occasionally turning the chicken. Once the liquid is boiling, reduce heat to a simmer. 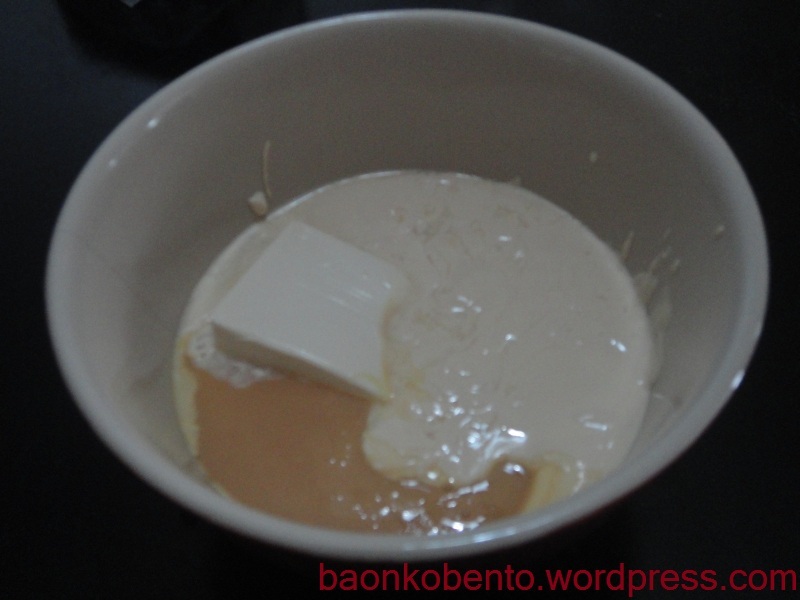 At this point, add 1 tbs soy sauce and 1 tbs vinegar and another 1-2 tbs of water. Simmer for around 8-10 minutes, again occasionally stirring to evenly coat and cook the chicken. At the 8-minute mark, start tasting the sauce. 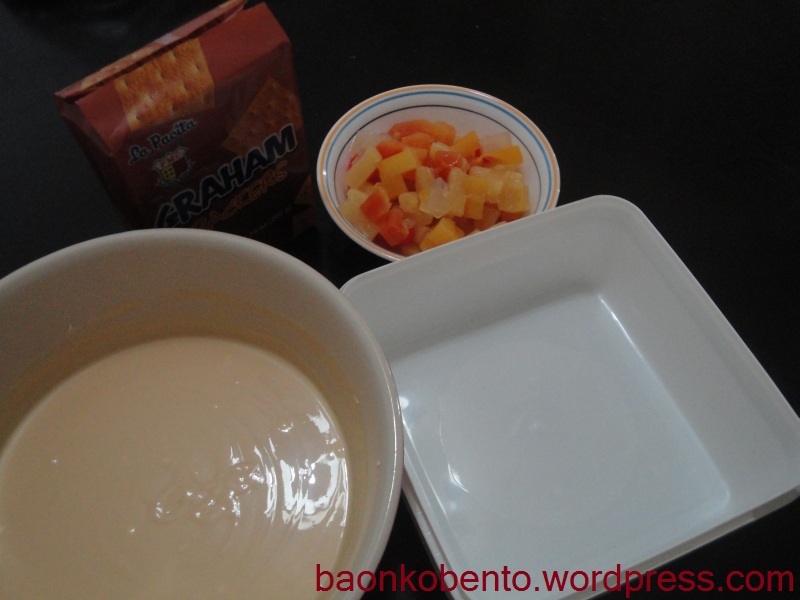 Add more salt or soy sauce if the sauce is too sour, or water if the taste in general is too strong. 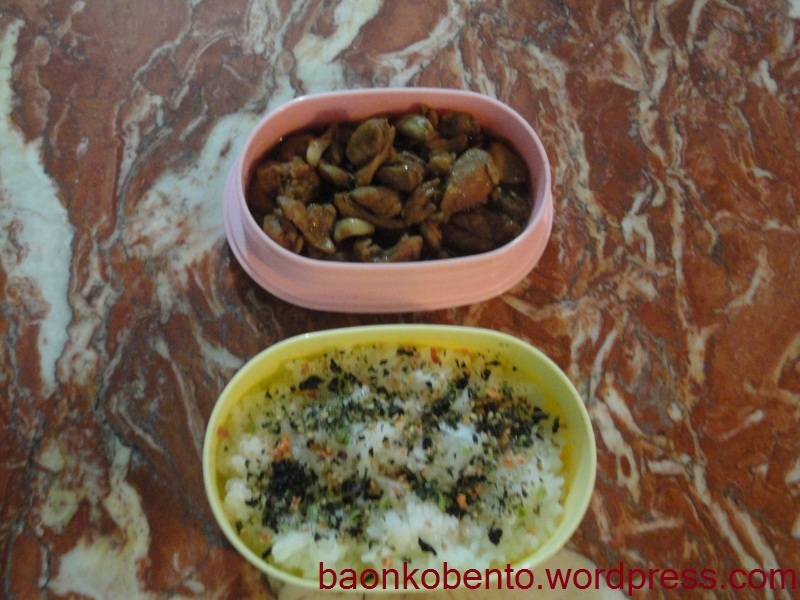 Here is a very simple bento with the adobo. It’s important here to choose a container that has a tight seal so the liquid will not spill out. Don’t flood the container with sauce. Around 1-2 tbs of the sauce should do it. 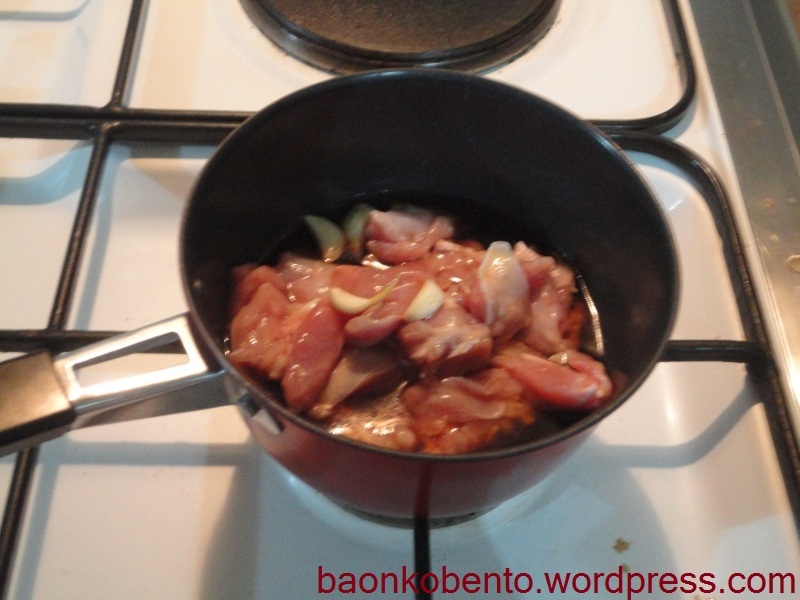 There you have it, a quick and painless adobo! 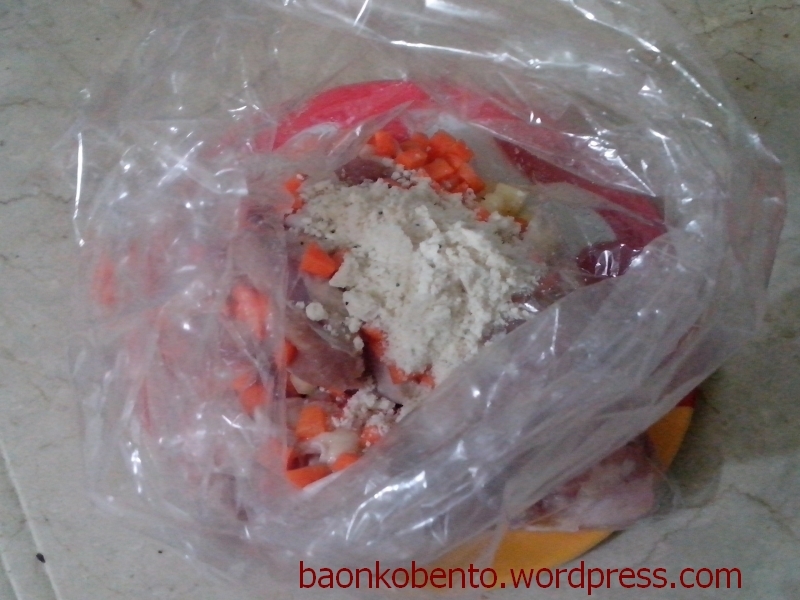 One of the staples that I use for my baon is carrot kaldereta, since it’s easy to prepare for a cooking newbie like me. 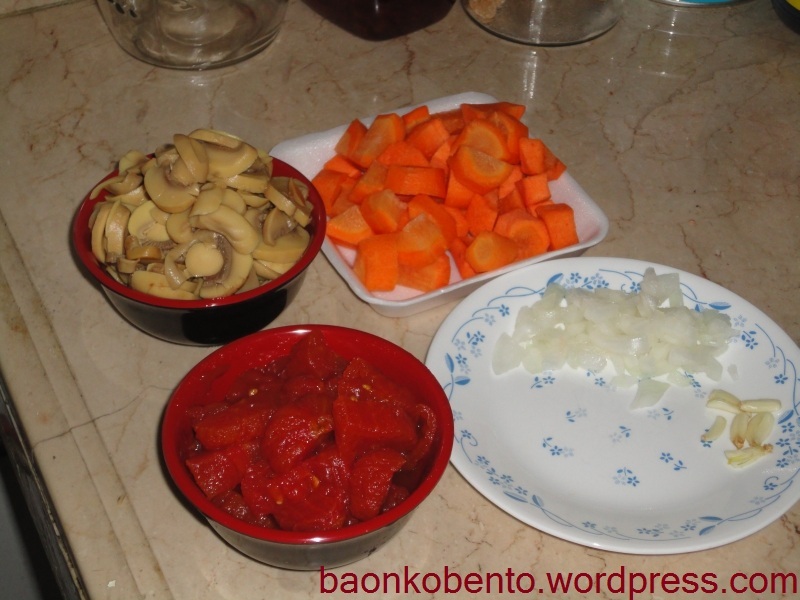 It’s basically a meat-less version of the traditional Philippine kaldereta, where beef is basically stewed in tomato sauce along with some vegetables like carrots and potatoes. My version uses carrots as the centerpiece, instead of meat, since I adore carrots and I always have a supply in my fridge. I whip up a batch of carrot kaldereta when I’m out of inspiration or out of time. In a medium or large saucepan, heat a little oil. Fry garlic and onions until they change color. 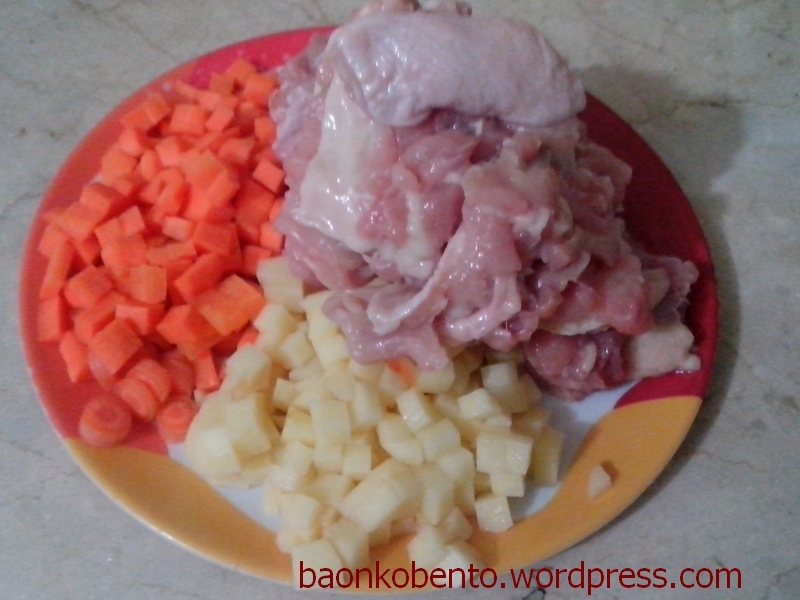 Add the chopped carrots and fry until coated with oil. 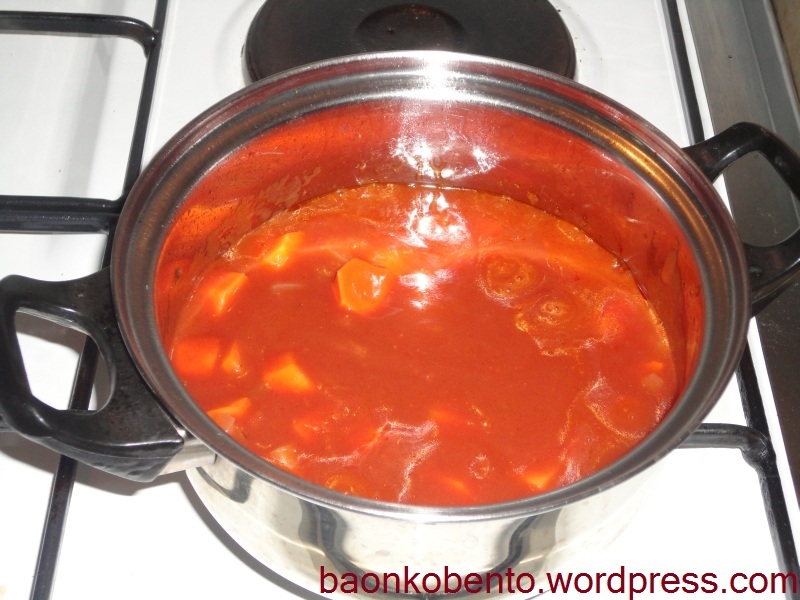 Pour in tomato sauce and turn up the heat until the tomato sauce starts boiling, then turn down the heat to medium. Add the mushroom, then simmer for 3-5 minutes. Finally add the tomato, then turn down the heat to low. Simmer until the carrots are soft enough for your preference. Season with salt and pepper to taste. This is where it gets tricky. 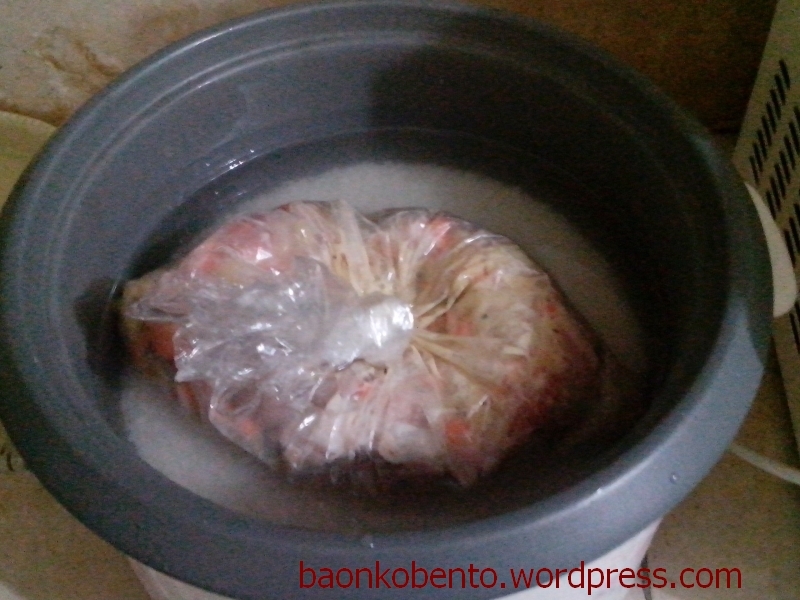 The final taste of the kaldereta depends mostly on the taste of the cook. I like mine to be not so sharp, but enough so I could still taste the tomatoes in the sauce. Sometimes I’d have to dilute the sauce with water, or add some sugar or soy sauce or herbs depending on the mix and flavor of the vegetables. Keep tasting the sauce and adjusting the flavor until it’s just right. The nice thing about this recipe is it’s very versatile. You can add/subtract ingredients without affecting the overall method, just adjust depending on the length of time it takes to cook a particular item. 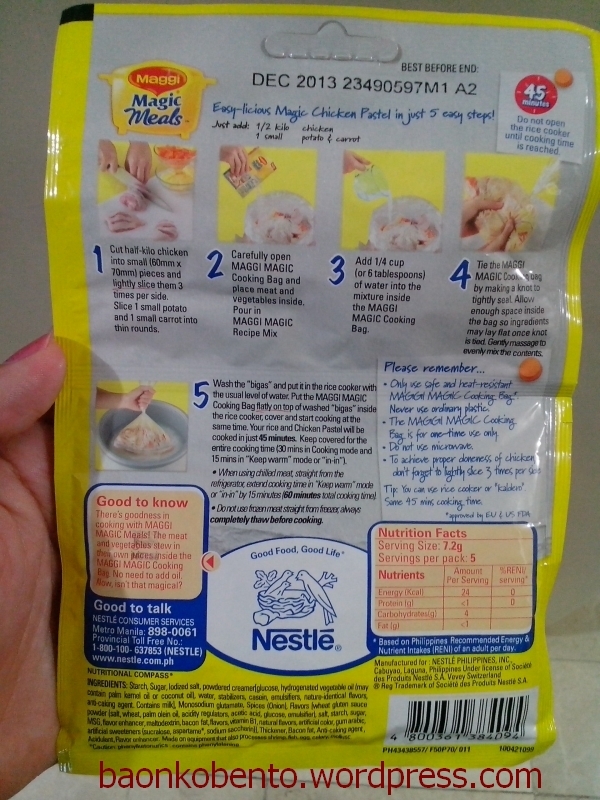 For example, if I use potatoes, I’ll put it in after the carrots and let it simmer in the sauce for around 3-5 minutes. You can even add meat, although you might need to simmer it for longer for it to become tender. 500 ml of sauce will render around 5 to 6 servings of kaldereta, and the dish will keep well covered in the fridge for up to a week without going bad. 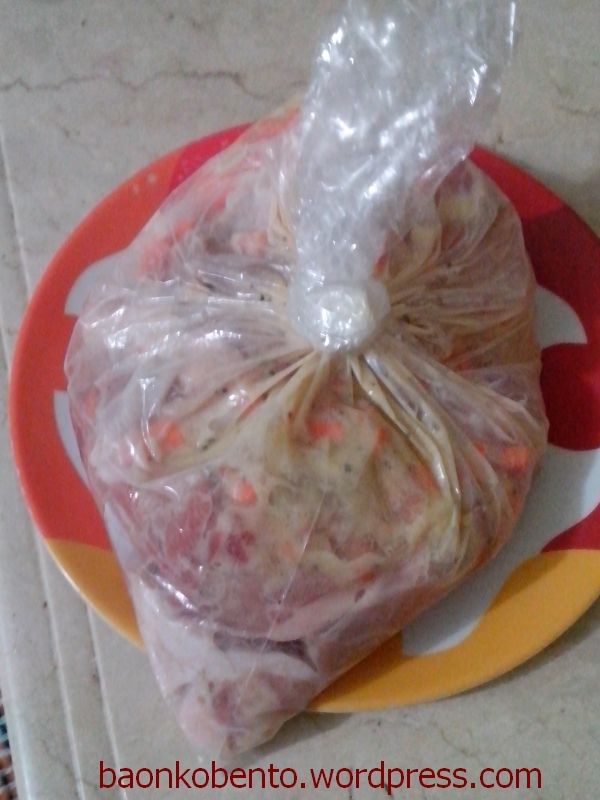 I had carrot kaldereta in my baon last week. 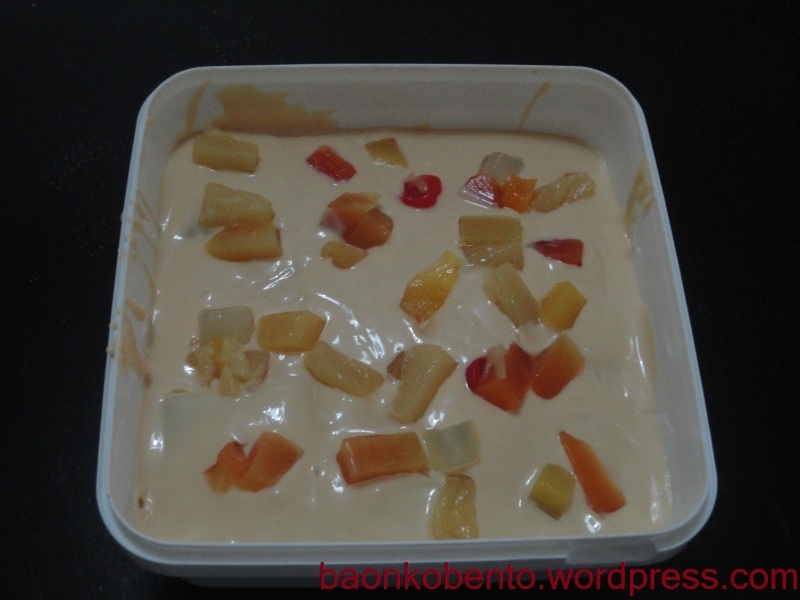 Since the kaldereta has runny sauce, it would do well to have good sturdy separators in the lunch box so it won’t spill onto the rest of the food. I used one of my bigger boxes, one with a pre-built separator. 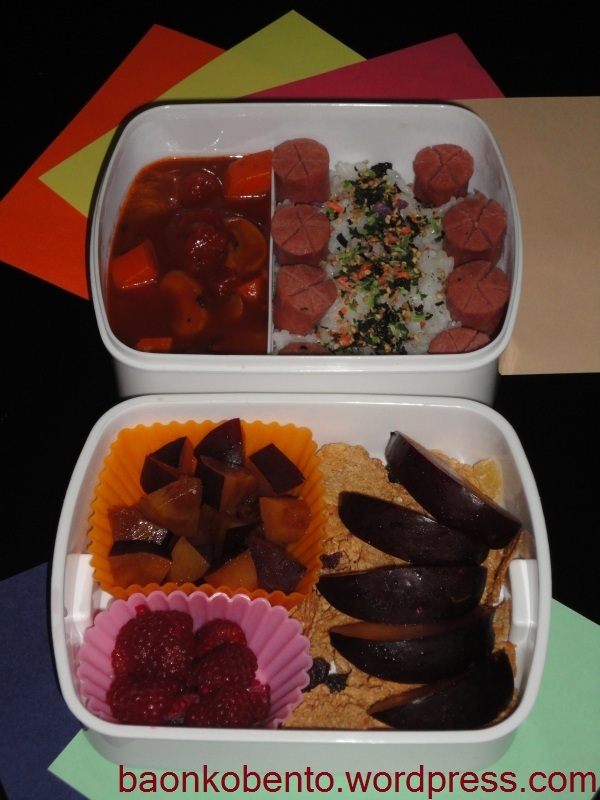 I have the carrot kaldereta in one side, and hotdog flowers and furikake rice in the other. The bottom compartment housed my breakfast (yes, I take my breakfast in the office): some raspberries and plums in silicone cups beside whole grain cereal, topped with more plums.